Bill Windsor feels corrupt judges and government officials who ignore the Constitution should be charged with TREASON. Treason is defined as violation of allegiance or duty to one's country or its government. It is also defined as violation of allegiance or of faith and confidence. So, in my opinion, there is absolutely no question that these people are committing treason. "I do solemnly swear (or affirm) that I will support and defend the Constitution of the United States against all enemies, foreign and domestic; that I will bear true faith and allegiance to the same; that I take this obligation freely, without any mental reservation or purpose of evasion; and that I will well and faithfully discharge the duties of the office on which I am about to enter: So help me God." Federal officials in the United States are bound by this oath to reject anything that violates the Constitution of the United States. When Constitutional rights are denied, the laws are ignored, and government officials allow corruption to go unchecked, tht's TREASON to me. This is crystal clear to me. Since we have federal government officials who have allowed the Constitution of the United States to be usurped, these people are domestic enemies of the people. I personally would rather die fighting against the domestic enemies that have usurped power in our country than live in a country where we think we are free. I believe we must work to educate our fellow Americans about what has happened. The first step is to expose these domestic enemies at all levels of government, and Lawless America has begun that process. "Domestic enemies are those within our own government who pursue legislation and programs that are contradictory to the powers and principles embodied in the Constitution. Domestic enemies are those who deny our Constitutional rights as a pattern and practice. Domestic enemies are those who either refuse to acknowledge the Constitution at all, or speak praises about its importance in public, but in private act in a manner that contradicts its restraint. Domestic enemies of the Constitution also include all those who support political officers who themselves are enemies of the Constitution." 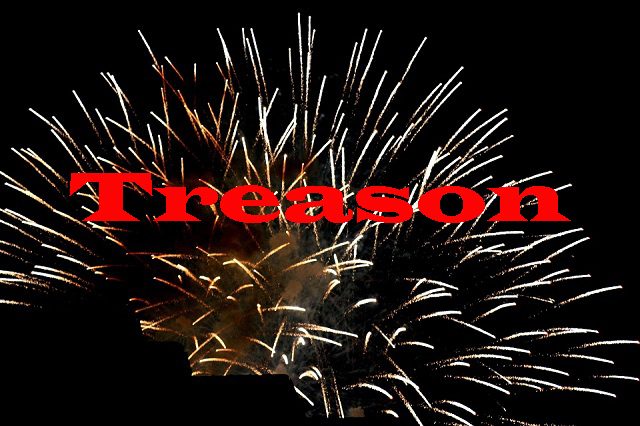 Treason is the crime that covers some of the more extreme acts against our country. A person who commits treason is known in law as a traitor. The Constitution does not itself create the offense; it only restricts the definition (the first paragraph), permits Congress to create the offense, and restricts any punishment for treason to only the convicted (the second paragraph). The crime is prohibited by legislation passed by Congress. Therefore the United States Code at 18 U.S.C. § 2381 states "whoever, owing allegiance to the United States, levies war against them or adheres to their enemies, giving them aid and comfort within the United States or elsewhere, is guilty of treason and shall suffer death, or shall be imprisoned not less than five years and fined under this title but not less than $10,000; and shall be incapable of holding any office under the United States." The requirement of testimony of two witnesses was inherited from the British Treason Act 1695. I personally support elimination of the death penalty for all acts except treason. I feel this way for two reasons. First, our criminal justice system is horribly broken, and way too many innocent people get convicted. Second, treason is so dangerous to so many that I believe death must be retained as a deterrent. I love America and our government. What I hate are the corrupt public officials who violate their oaths and have broken America, the traitors who have committed treason. I do not in any way advocate overthrowing our government. I advocate ridding us of all the corrupt traitors. This article explains the legislation that has been proposed by Lawless America. This has been provided to every member of the U.S. Congress and will now be provided to every state legislator in all 50 states. Now all we need are some elected officials who aren't traitors and who will do what is necessary to save America.